Cleveland magician, Expert Close up and corporate magic. AMAZING!! I DON"T BELIEVE IT!! SHUT UP!! OUTSTANDING!! These are the words used to describe the magic of Cleveland magician R J Goody. Cleveland magician R.J. Goody is a close up expert and a wonder to behold. His 30+ years of study and experience with magic are obvious to those who witness him performing his art. This Cleveland Magician broke a world record several years ago in coin manipulation in the presence of some of the top magicians in the country (Joshua Jay and Dave Williamson to name a few) and he is considered by many people to be one of the top close up magicians in the country with coins. Cleveland Magician RJ Goody is simply outstanding in his line of work. His mastery with cards always leave his audience impressed and befuddled. He has many repeat corporate clients that rave about his close up magic. "We were very pleased with the service provided . great compliments from invited guests. The magic show at the tables was a surprise that the guests enjoyed." Kindercare - The kids always enjoy your show and that's why we always have you back. Sarah - Kindercare activity planner. R.J. Goody has been a Cleveland magician for more than 30 years and has performed in many different locations throughout the United States. He has won many awards in both National and International competition. R J placed in the top ten in the country in International Magic competition in 2004 at the International brotherhood of magicians convention. 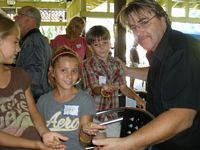 Besides his Corporate and Stand up shows, Rick loves to perform his 45 minute "AMAZING KID"S SHOW" filled with laughter, audience participation and amazing magic. This show is a favorite with Childcare centers and Elementary schools throughout the Ohio as well as private birthday parties. Cleveland Magician R.J. Goody performs close up , parlour, and on stage and is seen here doing his national award winning tableside close up magic at a corporate event. R.J. is available for corporate events, kid shows and street magic and restaurants and taverns and is sure to please anyone who hires him. He is one of the very best Cleveland Magicians. For a Cleveland Magic show, Please call with plenty of advance notice and prepare to be amazed. Travel Centers Amer, Eckhart Corp.
Steak and Shake Eckhart Corporation. Westfield Bank, FCI Elkton Corp.
Cleveland Magician R.J. also loves to do kid shows bo th in the home and at elementary and high schools across the state. His shows have plenty of magic, laughs and audience participation. He is also a favorite of many childcare centers such as Kindercare and Kids choice. Whether you want an amazing magic show, Walk around magic, expert close up magic, or a draw for your trade show, Cleveland magician R J Goody is a smart choice.